When we finally launched Little Images nearly two years ago, after seven years of research, writing, and preparation, I announced some ambitious projects. Open Letters, challenge videos, meetings with leaders. These were projects that targeted champions among Christian groups: influential authors, preachers, and even whole denominations. Some of our early activity was promising. We heard back from the giant Liberty University about possibly assisting with their curriculum and/or special sessions. Our staff have successfully contacted some Christian groups, pastors, and organizations with positive results. People who visit our blog have been spending an average of 4 minutes reading the Little Images site each time. That is a tremendous number. We haven’t arrived yet, but we’re heading in the right direction. But too many Christian influencers are afraid of alienating their listeners. With all of the social debates raging today, they feel there is too much on their plate already to risk antagonizing more people. So our task became a much more difficult one: individually reaching hundreds of thousands of the Christians sitting in the pews, school desks, and pulpits of small churches. Some leaders have been courageous enough to take a stand right now, but the rest will join them only once public Christian opinion has shifted far enough. As we realized this, I decided to create two spontaneous media items. Neither was meant, at its inception, to be a big project. 1) We made a quick video. We’ve been sharing stories on our blog since our founding, but this year was our first video form of a blog post. I knew short video posts did well, but the results were astounding: over 62,000 views and 1,000 total reposts as of this writing. A number of shares and comments are from people that have no relationship with any intactivists that we know of. That’s amazing for a Christian organization with no budget to speak of with a message many seem to shut their ears to. We’re working on short video posts for our regret parent stories, as well as targeted message videos for people struggling with specific questions. As with many things on social media, a very large portion of viewers were teenagers. That will strongly affect our future media. 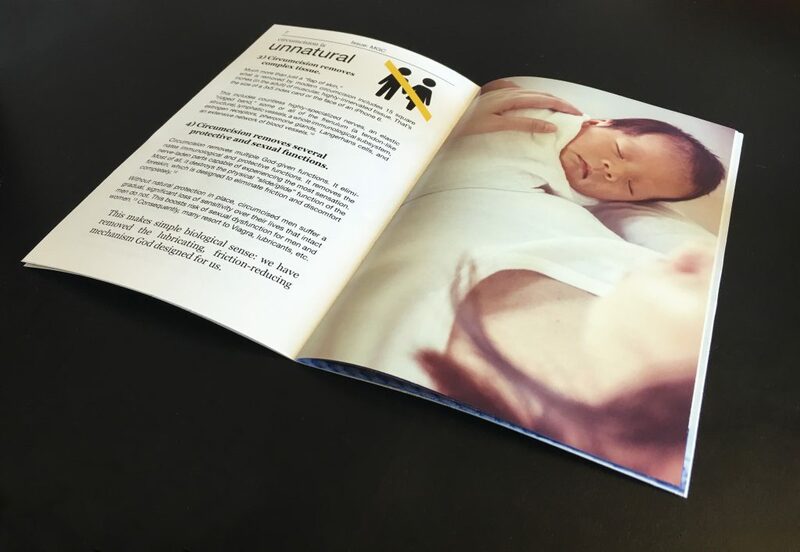 The Little Images MGC booklet includes five main sections, with an emphasis throughout on how circumcision violates core Christian principles. 2) Also, we designed a booklet. The booklet was originally designed for a one-time tabling event. The tabling event was shut down just as it was getting started, but we realized the booklet project had potential. Over the ensuing weeks, we enjoyed an outpouring of encouragment, support, and feedback from our friends on social media. The publication morphed into a comprehensive summary of the Christian position on circumcision, with quotations from Christians of all major eras and traditions. Its 22 pages, with 10 main text pages, also include a significant amount of medical and anatomical information. It features comfortable, breathable design, easily skimmable content, and in-depth endnotes to suit a variety of Christian readers. We announced our intention to ultimately distribute 1,000,000 of these, and used an early print run to send out hundreds and receive feedback on them. Other information – like medical, anatomical, and intact care information – is also presented. Many other important things happened this year. Little Images received 501(c)(3) exemption from the IRS and came under the leadership of a board that includes a highly distinguished pediatrician and pediatric urologist. We empowered hundreds of volunteers around the country with our info card options, sending out thousands of info cards of several kinds. Early 2017 will see several sign options, an economical business-size info card, and more. These are and will be available both on our Facebook store and on the Your Whole Baby store, which partners with us for merchandise. We did all of this on a very tight budget. We have no paid staff. We scour the Internet for the best deals on quality printing, photos, and web services. Our annual promotion budget is probably less than your monthly car payment. Every month, there were many things that took precedence over fundraising. True, there were some project deadlines that had to be delayed. The i2 Research Hub is moving slowly but has recently received 11 boxes of relevant, sometimes rare documents and is working on a large-scale archival project. Our social media account numbers are underwhelming, but the community we do have is growing and very supportive. And two major video projects have yet to see the light of day, but we have completed some of the filming work on them. The projects and outreach we did manage to complete have directly saved many babies this year. Furthermore, we have enabled good people everywhere to easily address this issue from a Christian perspective. As they and their acquaintances have children in the coming years, the fruit from that will multiply beyond counting. Thank you for everything you did for God’s little images. This proved to be a difficult year for each member of our head staff, our organization, and our mission. We could never have done any of this without you, and we’ll continue to rely on your support for the years ahead as we seek to see the end of this ungodly practice in the Church. Please consider helping us by volunteering, by becoming a donor, or by providing Little Images with discount or free services like printing, photos, or other services – all of which are tax-deductible. God is blessing our work, and together we will see great victories in 2017. Pete loves studying theology and history, playing classical and modern piano, learning languages, and playing Euro games. His missionary travels and seminary study (at Reformed Theological Seminary) quickly impressed him with the need to promote Christian ethics among Christian groups around the world, especially in places where children are being harmed. Pete lives in Princeton, New Jersey. I love LittleImages! I send lots of people to LittleImages, because the articles are so informative. Thank you, to your volunteers! Thank you for all you do. The video you created is EXCELLENT, and I’ve seen your organization cited many many times as a great resource when people are trying to persuade others to not circ. (Especially among religious groups). You truly are doing God’s work. The GOOD News is: Foreskin is Healthy. How do you make a post like this? I mean with the slider that contains images and links to your website and hiw to chose the content?